Sweet start on the nose with malted barley, toffee and fresh peaches and apricots, nicely mixed with notes of slightly roasted pears and bananas. The smoke is very discreet with soft peat, tender oak spice and lingering exotic rum flavours in the back. A very appealing nose! Deliciously sweet on the palate with barley sugar, toffee, baked yellow apples and pears, all nicely wrapped in soft peat smoke. Then warming spices emerge with oak, pepper, subtle nutmeg and tender cloves. The finish is medium long, warm and sweet with barley sugar and toffee, accompanied by lingering and gentle campfire smoke. Less smoky on the nose when a few drops of water are added. Quite fruity with lots of apples and pears, complemented with sweet notes of malted barley. 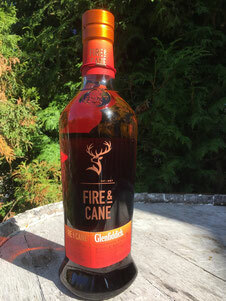 Still sweet and fruity on the palate, however, the warming spiciness with oak, black pepper and nutmeg comes to the fore with noticeable more peat smoke in the background. The finish is a bit shorter with warming notes of sweet toffee, rum and a whiff of smoke. Oh yes, this is another successful experiment by the folks from Dufftown! Reminds me of the first experiment, Glenfiddich IPA. Instead of the filigree notes of citrus and hops, here you find a perfect combination of sweet rum flavours, juicy fruit and gentle smoke. Indeed, the fine peat smoke very nicely supports the fruity, malty and sweet aromas of this bottling, without standing in the foreground. Very nice to drink, dangerously palatable.